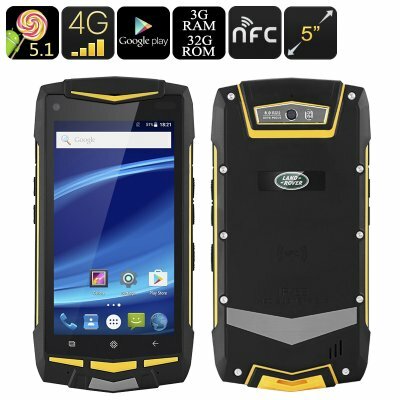 Successfully Added 5 Inch Rugged Android Smartphone - Quad-Core CPU, 3GB RAM, 4G, Dual IMEI, NFC, Google Play, 32GB Internal Memory, 4300mAh to your Shopping Cart. With this 5 inch smartphone you can live your life to the fullest and head out on your next outdoor adventure without ever needing to worry about the well being of your android device. Being fully rugged and IP67 waterproof this Android smartphone can deal with the most demanding situations in life. Scratches, drops, water, and bumps – this fully rugged smartphone takes what ever you throw at it. Its IP67 waterproof design lets you enjoy all the latest features that your Chinese smartphone has to offer no matter the weather conditions. Powered by a quad-core CPU along with 3GB of RAM this rugged smartphone can smoothly handle the latest Apps, games, and media. Its Android operating system lets you enjoy a lag free user experience that is fully capable of handling the most demanding multitasking sessions at ease. With Google Play installed this rugged Android phone allows you to download millions of free Applications, movies, games, and more that can be enjoyed to their fullest on the phone’s 5 inch HD display. Featuring 32GB of internal memory and an additionally 32GB of external storage this Chinese smartphone offers plenty of space for you to safe all your files and media. Head out into the wild and embark upon your next trip with confidence. With this rugged smartphone you will be able to carry along hour’s worth of entertainment, guaranteeing that there won’t be a single moment of boredom during your upcoming holidays. With its dual IMEI numbers this 5 inch phone allows you to be connected to two separate network providers simultaneously. Simply slip in two SIM cards and from now on you can be reached on two different phone numbers by using just one device, making this Android device the perfect smartphone to easily separate business and private life. 4G connectivity additionally lets you enjoy the fastest data speeds out there, guaranteeing that no matter where you’re headed you will always stay connected to your friends and family back at home. Packing a massive 4300mAh battery this Android phone lets you enjoy all its features for hours in a row without you needing to fear about battery life.